CaribPR Wire, NEW YORK, NY, Mon. Mar. 10, 2014: Fresh on the heels of the Jamaican bobsled team’s participation in the 2014 Sochi Games, the man who played a Jamaican bobsledder and wrote the theme song in the now infamous movie, “Cool Runnings,” is set to attend the biggest investment summit on the Caribbean outside the region, Invest Caribbean Now, (ICN). 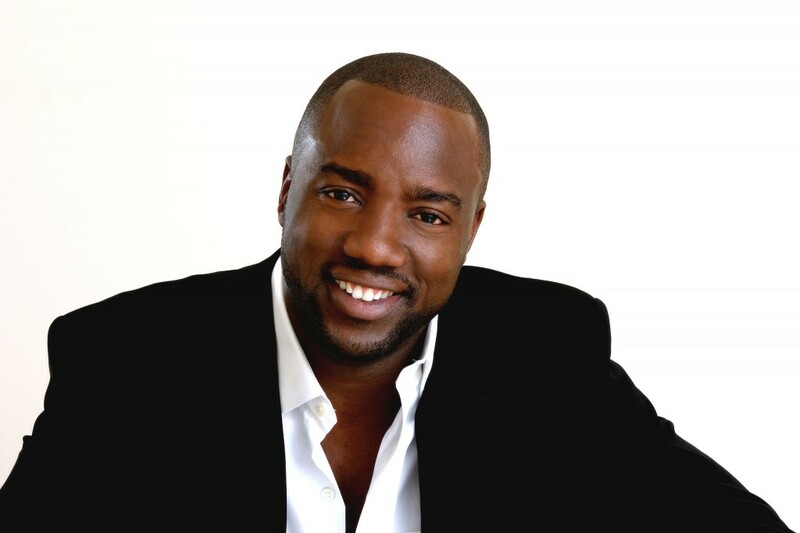 Hollywood actor and activist, Malik Yoba, will be among the top attendees at this year’s Caribbean Week in New York summit, set for June 4, 2014 at the prestigious Harvard Club of New York from 11:30 a.m. to 6:30 p.m.
Yoba’s attendance expresses his support for the Summit’s goals of sustainable development and investment towards building a stronger more economically viable region for the next generation and for Caribbean American Heritage Month in the United States. Thirty-plus acting credits have solidified Yoba’s status as a distinguished Hollywood actor. He has starred in a number of hit TV shows and movies including his groundbreaking role in the drama series ‘New York Undercover’ along with films like Tyler Perry‘s ‘Why Did I Get Married?’ and its sequel. Aside from acting, Yoba keeps busy with his heavy involvement in youth activism and mentoring. He has educated and inspired urban youth through a variety of projects encouraging them to express themselves creatively and reach their full potential. 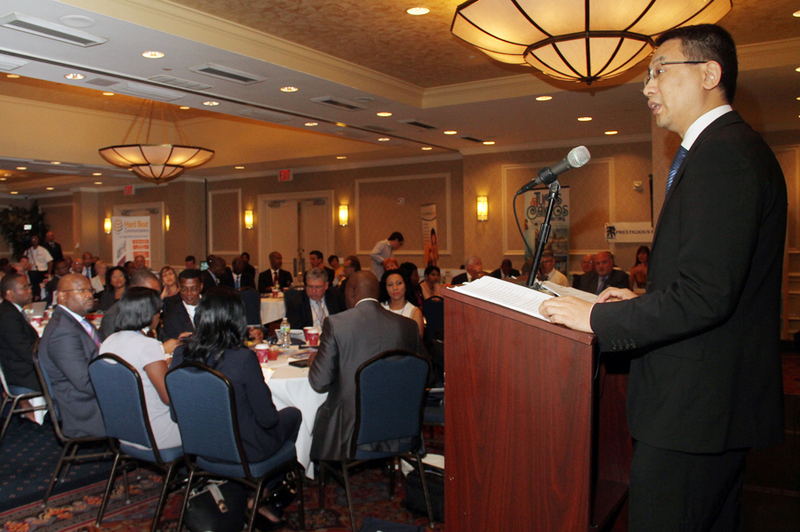 This year’s summit top delegates will include Caribbean government dignitaries from across the region, including Premier of Nevis, Vance Amory; Chinese government officials; New York City elected officials; chairman of over two dozen companies throughout the Caribbean, North America and Great Britain, including Sandals Resort, Gordon ‘Butch’ Stewart and representatives from the World Bank, the IDB, the US State Department’s IdEA, Merrill Lynch, Nomura, HBO Latin America, DHL, First Citizens Investment Services, Island Global Yachting, Lugano Group, Caribbean Airlines, Laparkan, Caribbean Television, the Russian American Chamber of Commerce, the Allied African Nations Chamber Of Commerce and the Chinese American Business Development Center, among numerous others. Harvard, Princeton and Colombia graduate and Caribbean-born scholar, Dr. Isaac Newton will deliver the keynote address on the issue of economic development and global investment outreach while Woody Wilson, designer to stars like Brad Pitt, Matt Damon, Dwayne ‘The Rock’ Johnson and Terrance Howard, will launch his Tropical Collection for the Caribbean. Special partnership and co-branding opportunities for this prestigious event are available by contacting sheila@investcaribbeannow.com or logging on to ICN’s brand new summit page at Investcaribbeannow.com. An exclusive Diamond Dinner has been added to this year’s summit for only 20 people who will include Malik Yoba, Gordon ‘Butch’ Stewart and Woody Wilson. Tickets are available on an invitation only basis by contacting Joe Bernstein at joe@investcaribbeannow.com. Partners for ICN 2014 include: Hard Beat Communications, The Caribbean Tourism Organization, One Caribbean Television, The Woody Wilson Collection of Beverly Hills, The PR Newswire, the Caribbean Commerce Magazine, Blinglets, The Caribbean Council for Economic Development, the Chinese Business Development Center, Woody Wilson Fine Clothing, CaribPR Wire and News Americas Now. TORONTO, Jan. 29, 2014 /PRNewswire/ — Royal Bank of Canada (RY on TSX and NYSE) today announced that it has entered into a definitive agreement to sell RBC Royal Bank (Jamaica) Limited and RBTT Securities Jamaica Limited (collectively “RBC Jamaica”) to Sagicor Group Jamaica Limited. The transaction is subject to customary closing conditions, including regulatory approvals and is expected to be finalized in the coming months. While financial terms of the transaction were not disclosed, the purchase price approximately reflects the book value of RBC Jamaica. RBC expects the transaction to result in an estimated loss of C$60 million (before and after-tax) as a result of International Financial Reporting Standards, largely related to an estimated writedown for the proportionate share of RBC Jamaica goodwill and other intangibles acquired by RBC in connection with its acquisition of RBTT Financial Group in 2008. The transaction is not expected to have a material impact on RBC’s Basel III Common Equity Tier 1 ratio. The loss is based on current estimates and is subject to change and will be reflected in the results of the first quarter ending January 31, 2014. RBC will release its first quarter 2014 results and host an earnings conference call on February 26, 2014. Royal Bank of Canada (RY on TSX and NYSE) is Canada’s largest bank and one of the largest banks in the world, based on market capitalization. We are one of North America’s leading diversified financial services companies, and provide personal and commercial banking, wealth management services, insurance, investor services and capital markets products and services on a global basis. We employ approximately 79,000 full- and part-time employees who serve more than 15 million personal, business, public sector and institutional clients through offices in Canada, the U.S. and 44 other countries. For more information, please visit rbc.com. Certain statements contained in this press release may be deemed to be forward-looking statements within the meaning of certain securities laws, including the “safe harbour” provisions of the United States Private Securities Litigation Reform Act of 1995 and any applicable Canadian securities legislation. These forward-looking statements include, but are not limited to, statements with respect to the loss relating to the sale of RBC Jamaica expected to be reflected in our first quarter 2014 financial results. Forward-looking statements are typically identified by words such as “believe”, “expect”, “foresee”, “forecast”, “anticipate”, “intend”, “estimate”, “goal”, “plan” and “project” and similar expressions of future or conditional verbs such as “will”, “may”, “should”, “could” or “would”. By their very nature, forward-looking statements require us to make assumptions and are subject to inherent risks and uncertainties, which give rise to the possibility that our predictions, forecasts, projections, expectations or conclusions will not prove to be accurate, that our assumptions may not be correct and that our forward-looking statements, including statements about the loss relating to the sale of RBC Jamaica expected to be reflected in our first quarter 2014 financial results, will not be achieved. We caution readers not to place undue reliance on these statements as a number of risk factors could cause our actual results to differ materially from the expectations expressed in such forward-looking statements. These factors – many of which are beyond our control and the effects of which can be difficult to predict – include: credit, market, liquidity and funding, insurance, regulatory compliance, operational, strategic, reputation and competitive risks and other risks discussed in the Risk management and Overview of other risks sections of our 2013 Annual Report; the impact of regulatory reform; the business and economic conditions in Canada, the United States and certain other countries in which we operate; the effects of changes in government fiscal, monetary and other policies; and judicial or regulatory judgments and legal proceedings. We caution that the foregoing list of risk factors is not exhaustive and other factors could also adversely affect our results. When relying on our forward-looking statements to make decisions with respect to us, investors and others should carefully consider the foregoing factors and other uncertainties and potential events. Material economic assumptions underlying the forward looking statements contained in this press release are set out in the Overview and outlook section and for each business segment under the heading Outlook and priorities in our 2013 Annual Report. Additional information about these and other factors can be found in the Risk management and Overview of other risks sections of our 2013 Annual Report. Except as required by law, we do not undertake to update any forward-looking statement contained in this press release. HAMILTON, Bermuda, Jan. 7, 2014 /PRNewswire/ – Capital G Limited announced today that it had entered into a formal agreement on 31st December 2013 to amalgamate with Clarien Group Limited (”Clarien”), a wholly owned subsidiary of CWH Limited with continued growth plans to develop its business domestically and internationally as a world class offshore financial institution. Through Clarien, CWH Limited, a newly formed Bermuda exempted company will assume the majority ownership of Capital G Bank Limited, while Edmund Gibbons Limited will remain involved as a minority shareholder. The transaction, which received approval from the Bermuda Monetary Authority and the Government of Bermuda, places Capital G Bank in a position to build a leading offshore financial company with expertise in asset management, private banking and investment banking to clients from around the globe. CWH Limited founders include David Carrick, Robert Flohr, Zoran Fotak, Mitchell Hedstrom, Ian Truran and Keith Stock. Collectively they bring significant executive level experience to Capital G Bank and the newly formed Clarien Group. All founders will play an active role in the management and strategic growth of the institution and plan to live and work in Bermuda. Mr. Stock will be Chairman of Capital G Bank, Messrs. Fotak and Truran will be Co-Chief Executive Officers, Mr. Carrick will be Chief Financial Officer, Mr. Hedstrom will be Chief Risk Officer and Mr. Flohr will be the Chief Corporate Development Officer. James Gibbons will remain actively involved and serve as a Director of Capital G Bank Limited. The partnership exemplifies the appeal Bermuda has to global investors, partners and clients. The Island’s sophisticated infrastructure, intellectual talent and accessibility to the world positions the Clarien Group perfectly to bring some of the world’s most discerning institutional and private wealth clients to Bermuda. It is expected that over the next five to ten years profitability of the institution will grow significantly with expansion into new lines of business and growth into new markets enabling the continued employment of Bermudian and international talent. CaribPR Wire, NEW YORK, NY, Mon. January 6, 2014: Cloud Capital Group, (CCG), the Caribbean’s trusted advisor and a leading provider of mobility solutions and cloud services, today announced its partnership with e-Cycle, a global leader in wireless mobile buyback, data security and recycling for businesses. The workplace continues to evolve into a mobile environment, and with that, businesses and workers are consistently updating to the latest and greatest devices to stay ahead of the curve. For companies, this can be a financial burden as well as a security concern. More importantly, discarded devices can have a significant effect on the environment. As e-Cycle points out, electronic waste represents 70% of toxins in landfills. By participating in a buyback program and recycling used company devices, businesses can recoup lost revenue, take the necessary security precautions, and make a positive impact on the environment, all while updating their mobile fleet to the most up-to-date devices. e-Cycle’s mobile buyback program takes a simple approach to mobile device recycling. With e-Cycle’s program the environment is a top priority. During the recycling process all shredded materials, batteries and accessories are recycled in an e-Stewards Certified, EPA-registered facility; and the materials are recovered for reuse. Organizations receive reports detailing the positive effect their recycling efforts have made on the environment. With an effective mobile device buyback program like e-Cycle in place, it empowers organizations to safeguard the environment, protect their wireless security, and turn used mobile devices into alternative revenue. In addition, with Cloud Capital Group, Caribbean businesses and organizations will be able to take full advantage of e-Cycle’s mobile device recycling program in the most simplified process. The mobile devices are shipped to e-Cycle, wiped clean of private company data and sent to be recycled, then the company receives a check. Cloud Capital Group can be contacted directly to learn more about e-Cycle’s buyback program. e-Cycle helps organizations and individuals take a more responsible, secure and cost-effective approach to wireless recycling. The company collects mobile phones and tablets from businesses and individuals, reimbursing them for devices that retain value and recycling all others at no charge. The information on every device is either deleted or destroyed through the industry’s most rigorous data security measures. Through the e-Cycle Foundation, organizations can use proceeds from their wireless buyback and recycling programs to make tax-deductible donations to the charities of their choice. In 2012, e-Cycle became the first e-Stewards certified wireless buyback company in the world. Cloud Capital Group (CCG) is a global business technology company providing white-label cloud services for resale, support, maintenance, that also provides infrastructure build consulting, training and marketing for global telecommunications carriers, technology resellers, and managed service providers. CCG bridges the gap for these organizations by providing turnkey solutions to allow quick access to a wide array of applications and solutions running on our own infrastructure. Cloud Capital Group (CCG) prides itself on being more than just a cloud technology company. CCG works hand-in-hand with their customers, and shares the rewards of a successful partnership. MIAMI, Dec. 26, 2013 /PRNewswire/ – The Eastern Caribbean Supreme Court of Antigua and Barbuda dismissed an order sought by Davos International Bank against its ex-partners and ex-directors, Rodrigo Fernandez and Andres Omar Sotillo, due to grave failures in following the required legal procedure, including concealing judicial information, according to the judgment issued by the Court last December 6th. Davos International Bank’s order was reversed by the highest court of Antigua and Barbuda, based upon the argument that the bank managed by David Osio did not meet the established legal procedures to serve the complaint and that it deliberately concealed the existence of a legal action against it filed by the Defendants before a US Court. Davos International Bank’s complaint in Antigua and Barbuda also included the Bank’s former employees Jose Daniel Carrillo and Osleidys Estrada, who just as Fernandez and Sotillo had their responsibility in this Caribbean jurisdiction eliminated once the order was vacated. The highest court of Justice of Antigua and Barbuda also ordered Davos International Bank to cover the legal expenses incurred by the defendants to obtain the dismissal of the prior order. As opposed to the false information provided by Davos International Bank in the press release dated October 14, 2013, the complaint of David Osio and Davos International Bank in Antigua is only a civil claim filed as a “defensive tactic” against Sotillo & Fernandez’s complaint which is moving forward in a Miami Court where it has been litigated favorably for more than two years. The attorneys have also stated that the decision of the Supreme Court of Antigua and Barbuda ratified the lack of existence of any legal culpability determination in that court against Fernandez, Sotillo, Carrillo and Estrada. ANNAPOLIS, Md., Dec. 18, 2013 /PRNewswire/ – American Capital Energy & Infrastructure (”ACEI”) announced today that it has partnered with a veteran management team to create BMR Energy LLC (”BMR”), a new energy company focused on developing and investing in power and related energy infrastructure throughout Central America and the Caribbean. Led by Bruce Levy as Chief Executive Officer, BMR’s management team has over 60 years of collective experience in global energy project development, acquisition and operations. Mr. Levy has held key executive positions in the U.S. and international energy sectors for the past 30 years, most recently as President and CEO of International Power North America (now part of GDF SUEZ Energy International). Mr. Levy is joined by Andrew Rovito and Pip Decker. Mr. Rovito has extensive experience in global energy project development and finance and most recently co-founded Development Partners Group, a developer of fossil fuel independent power projects throughout the U.S. Mr. Decker has been involved in the renewable energy industry, focused on the development, construction and operation of wind and solar facilities throughout the U.S., and, prior to BMR, focused on project development for Brookfield Renewable Power. BMR’s first project is a 34 MW wind farm in Malvern, St. Elizabeth Parish, Jamaica. In September 2013, the Office of Utility Regulation in Jamaica selected BMR to build, own, and operate the wind project, which is expected to be operational in 2015. The company also has a mature project pipeline throughout the region. American Capital Energy & Infrastructure invests in global energy infrastructure assets, including power generation facilities, power distribution and transmission networks, energy transportation assets, fuel production opportunities and product and service companies focused on the power and energy sectors. ACEI is part of American Capital, Ltd.’s (Nasdaq: ACAS) (”American Capital”) asset management affiliate, American Capital Asset Management, LLC. For further information, please refer to www.ACEI.com. American Capital is a publicly traded private equity firm and global asset manager. American Capital, both directly and through its asset management business, originates, underwrites and manages investments in middle market private equity, leveraged finance, real estate, energy and infrastructure and structured products. American Capital manages $20 billion of assets, including assets on its balance sheet and fee earning assets under management by affiliated managers, with $117 billion of total assets under management (including levered assets). Through an affiliate, American Capital manages publicly traded American Capital Agency Corp. (Nasdaq: AGNC) with approximately $10 billion of net book value and American Capital Mortgage Investment Corp. (Nasdaq: MTGE) with approximately $1 billion of net book value. From its eight offices in the U.S. and Europe, American Capital and its affiliate, European Capital, will consider investment opportunities from $10 million to $750 million. For further information, please refer to www.americancapital.com. Headquartered in New York City, BMR Energy was founded in 2013 to focus on acquiring, developing, owning and operating power and energy related assets in the Caribbean and Central America. The BMR team brings more than 60 years of combined international energy infrastructure development and operational experience. Loading up on cans for Canstruction® 2013. CaribPR Wire, ST. THOMAS, USVI, Thurs. Nov. 28, 2013: Thanksgiving is traditionally a time when the community opens their hearts and wallets to help their less fortunate neighbors. Leave it to advertising professionals to come up with a clever way to collect food for the hungry. The Caribbean Advertising Federation is hosting the territory’s first-ever Canstruction event in the U.S. Virgin Islands. Canstruction® is a competition that pits corporate teams against each other to create the best sculpture made entirely of canned foods. 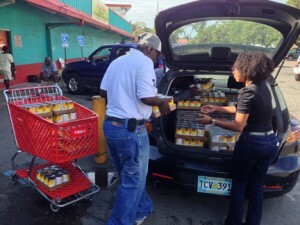 The works of canned art are judged, exhibited to the public, and then dismantled and distributed to Catholic Charities of the U.S. Virgin Islands, the Salvation Army and Family Resource Center. The competition is being hosted at Tutu Park Mall in the former FYE store this Saturday from 10 a.m. – 5 p.m.
Scotiabank’s sculpture alone will consist of more than 1,200 cans. Sadie Clendinen, Marketing Manager for Scotiabank is looking forward to this “uncanny” event. “The employees of Scotiabank conduct a food drive every year. This is a different and very visible way of bringing community attention to the fact that we have hungry families right here on St. Thomas. We are making sure everyone on St. Thomas has a healthy holiday meal and having a great time doing it,” said Clendinen. There is no admission fee to watch the Canstruction event and cheer on your favorite corporate team. Scotiabank, Choice Wireless®, MLB Creative and the V.I. Daily News will be vying for the best use of labels and structural design. You can vote for your favorite sculpture by donating one can of food, so bring a bag to donate and vote multiple times. Canstruction® was founded in 1992 to help promote the design community and raise food hunger relief efforts. Canstruction® has held events in over 140 cities worldwide donating over 15 million pounds of canned food to alleviate the plague of hunger and malnutrition. VERONA, Pa., Nov. 22, 2013 /PRNewswire/ – Conco Systems, Inc. is proud to announce their new partnership with Serpaga, Inc. in San Juan, Puerto Rico. While Serpaga’s name is new to the power generation industry, they inherited many years of experience from Passco, Inc., their predecessor. Not only does Serpaga operate out of Passco’s former facilities, but Serpaga also continued the partnership started between Passco and Conco several years ago. Now, Serpaga is a leader in providing tube and condenser cleaning products and services to the power generation industry in Puerto Rico. Conco Systems has extended a letter of exclusive representation to Serpaga so that Conco products and services will once again be available in Puerto Rico. Serpaga, Inc. will provide Conco Tube Cleaning, Leak Detection, and Eddy Current Testing. In addition, Serpaga will be offering new services like Condenser Cleanliness Inspections and Total Condenser Performance Audits to local power plants and the power authority company. Founded in 1923, Conco is the world’s leading provider of condenser and heat exchanger services to the power generation industry with offices located in the US, Europe, and Asia Pacific. For more information on Conco Systems, please visit: http://www.concosystems.com. CaribPR Wire, NEW YORK, NY, Sun. 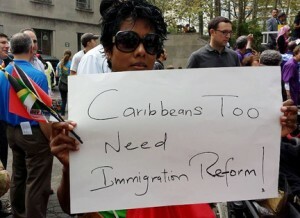 Oct. 6, 2013: Caribbean-born, New York-based media entrepreneur and columnist, Felicia J. Persaud, was among tens of thousands in the United States joining the march nationally for Comprehensive Immigration Reform, (CIR), on Saturday, October 5, 2013. The Hard Beat Communications executive, along with Guyanese Valence Williams and Menes De Griot were the lone Caribbean nationals joining the New York Immigration Coalition organized rally in Brooklyn, NY, as they put the spotlight on the voiceless Caribbeans who are undocumented and desperate for immigration reform yet remain in the shadows. Carrying a sign that read simply: “Caribbeans Too Need Immigration Reform,” Persaud, founder of CaribPR Wire, News Americas Now and Invest Caribbean Now, who has penned her 46th open letter to President Obama in her weekly column in the New York Amsterdam News calling for immigration reform now, got the thumbs up from Chirlane McCray, the wife of New York City mayoral front-runner, Bill de Blasio, whose roots extend to the Caribbean, as she proudly carried her sign around Cadman Plaza, Brooklyn, NY. 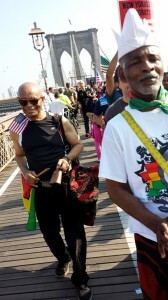 Then along with De Griot on the drum and Williams on the cowbells, Persaud marched over the Brooklyn Bridge Saturday afternoon along with thousands of mainly Latino advocates to send a message to President Obama and the U.S. Congress that passage of comprehensive reform reform was an issue just as important as the debt ceiling and the re-opening of the government. “The fact the U.S. Citizenship and Immigration Service and consuls worldwide are largely open because of immigrants fees and the government shutdown has not affected them tells why the Congress needs to pass CIR now,” Persaud said. Though they were only three, the small Caribbean contingent stole the show with their rhythm and sent a clear message that the Caribbean was in the house and also needed immigration reform. Carrying a sign that read simply, “Caribbeans Too Need Immigration Reform,” Persaud, founder of CaribPR Wire, News Americas Now and Invest Caribbean Now, who has penned her 46th open letter to President Obama in her weekly column in the New York Amsterdam News calling for immigration reform now, got the thumbs up from Chirlane McCray, the wife of New York City mayoral front-runner, Bill de Blasio, whose roots extend to the Caribbean, as she proudly carried her sign around Cadman Plaza, Brooklyn, NY. Then along with De Griot on the drum and Williams on the cowbells, Persaud marched over the Brooklyn Bridge Saturday afternoon along with thousands of mainly Latino advocates to send a message to President Obama and the U.S. Congress that passage of comprehensive reform reform was an issue was just as important as the debt ceiling and the re-opening of the government. The march by tens of thousands nationally took place on the 100th day anniversary since the passage of the Border Security, Economic Opportunity, and Immigration Modernization Act in the Senate. The Republican controlled House has refused to bring the measure to a vote, insisting they will address the hot button issue through smaller bills only but has yet to bring any bills to the House floor. The rally was held under the theme, “National Day of Immigrant Dignity and Respect,” and came just days after House Democrats introduced their own immigration bill in the U.S. House of Representatives, calling too for immigration reform and a path to citizenship for 11 plus million undocumented immigrants in the United States. GEORGETOWN, Guyana, Oct. 4, 2013 /PRNewswire/ — Researchers from universities in Canada and the Caribbean will discuss improvements in the region’s agriculture and nutrition during the Caribbean Week of Agriculture (CWA2013): Linking the Caribbean for Regional Food and Nutrition Security and Rural Development, to be held in Guyana, October 4-12, 2013. Since 2011, researchers from the University of the West Indies in Trinidad and Tobago and McGill University in Canada have been working together to improve to improve food production in the region, as well as the nutrition and health of CARICOM populations. The project is funded under the Canadian International Food Security Research Fund (CIFSRF), a CA$124 million program that supports partnerships between Canadian and developing-country researchers to increase food security through applied research in agriculture and nutrition. The From farm to fork: improving nutrition in the Caribbean project seeks to address rising obesity rates in the region, due in large part to the limited attention Caribbean countries have paid to local food production. As a result, there is a high dependence on imports of high-calorie, low-nutrition foods. This has created a paradox of obesity and poor nutrition, which threatens people’s health throughout the region. Results to date are promising. Children in Trinidad and Tobago and St. Kitts and Nevis are receiving improved school meals that contain vegetables and fruit produced by local farmers. By adopting water management techniques such as drip irrigation and mulching, crop production has increased. Farmers have also diversified their crops. These and other research results will be presented during the two-day workshop Coming Soon: A Healthier, Food Secure Caribbean: Improving Nutrition and Health of CARICOM Population, Oct. 10-11. IDRC will also participate in the CWA2013 exhibition and trade show. Journalists are invited to visit the interactive CIFSRF CARICOM Food Security Project booth to learn more about the work that the research teams are carrying out in Guyana, Trinidad and Tobago, St. Kitts and Nevis, and St. Lucia. Experts from IDRC, McGill University, and the University of the West Indies will be available for interviews before and during CWA2013. Journalists and the public can join in the conversation through Twitter (#IDRC and #CWA2013) and Facebook. For more information, visit www.idrc.ca. Canada’s International Development Research Centre (IDRC) funds practical research in developing countries to increase prosperity and security, and to foster democracy and the rule of law, in support of Canada’s international development efforts. We promote growth and development and encourage sharing knowledge with policymakers, other researchers, and communities around the world. The result is innovative, lasting solutions that aim to bring change to those who need it most. CIFSRF is a CA$124.5 million program of Canada’s International Development Research Centre, undertaken with the financial support of the Government of Canada provided through Foreign Affairs, Trade and Development Canada. CIFSRF supports applied research partnerships between Canadian and developing-country organizations to find lasting solutions to hunger and food insecurity. It is a core element of Canada’s Food Security Strategy. OTTAWA, Ontario, Oct. 3, 2013 /PRNewswire/ — The Royal Canadian Mint is pleased to announce recent contract wins with the Eastern Caribbean Central Bank (ECCB), the Central Bank of Barbados and Centrale Bank van Curacao en Sint Maarten, representing both circulation and numismatic coins. “For the past 35 years, the Mint has proudly produced coins for over 75 countries and maintaining and expanding our international business through superior quality and customer service remains a top priority,” said Ian E. Bennett, President and CEO of the Royal Canadian Mint. Production of one-cent circulation coins for the ECCB. This represents a re-order for this denomination, with the ECCB being a customer of the Mint’s since 2008. The ECCB is the monetary authority of a group of eight independent Caribbean nations, namely namely Anguilla, Antigua and Barbuda, the Commonwealth of Dominica, Grenada, Montserrat, St Kitts and Nevis, St Lucia, and St Vincent and the Grenadines. Production of five-cent circulation coins for the Central Bank of Barbados. The Mint has been proudly working with the Central Bank of Barbados since 1978. A first-ever numismatic coin contract with the Centrale Bank van Curacao en Sint Maarten to produce painted nickel-silver coins to celebrate the 4th edition of the Curacao North Sea Jazz Festival, which took place at the end of August. The Royal Canadian Mint offers foreign customers a full spectrum of coin manufacturing and consulting services; from the production of circulation numismatic coins; ready-to-strike blanks; medals, medallions and tokens; to coin distribution management, marketing and communications, and technology transfers. ATLANTA, Oct. 2, 2013 /PRNewswire/ – In April of this year, Cummins Power South announced plans for the expansion of its Cummins Power Generation business in the Caribbean. A vital part of the Caribbean expansion focuses on partnering with local businesses in the area to provide customers with Cummins world class support and exceptional service. Cummins Power South is pleased to announce Tess Truck & Equipment Sales and Services as the official Cummins Power Generation dealer in the Bahamas. Tess Truck & Equipment Sales and Services has been in business since the early 1970s providing industrial vehicles and equipment to the Bahama islands through their flagship of Bahamas Mack. Expanding upon their product offering, Tess Truck & Equipment Sales and Services will now provide the full line of Cummins Power Generation products from residential and light commercial generators to commercial generator sets and power systems. As the infrastructure in the Bahamas continues to grow, Tess Truck & Equipment Sales & Services, with the support of Cummins Power South, will help meet the energy needs of expanding industries such as healthcare, hospitality, government and water management as well as supply dependable backup emergency power for residential homes and communities throughout the islands. Tess Truck & Equipment Sales and Services will serve as the main source of Cummins Power Generation sales and service, offering legendary Cummins service as the only certified Cummins Power Generation dealer in the Bahamas. Detailed information on Cummins Power South and the expansion in the Bahamas may be obtained by visiting the company’s website at www.cumminspowersouth.com/bahamas/ . CaribPR Wire, NEW YORK, NY (September 24, 2013) – Rodney Leon Architects announced its winning design of the International Competition for the Permanent Memorial at the United Nations as a significant symbol to remember and honor the victims of slavery and the Transatlantic Slave Trade. The United Nations’ theme for the competition, “Acknowledge the Tragedy, Consider the Legacy, Lest We Forget,” formed the inspiration for Rodney Leon’s winning design entitled The Ark of Return. Leon’s winning design expresses the cross-cultural and global impact of the slave trade, while honoring those who have died and those who have shared their struggle. The international competition garnered 310 entrants from 83 countries. A panel of internationally acclaimed design professionals, artists, and other relevant stakeholders served as jurors. Haitian-American Leon was unanimously chosen from among seven finalists representing countries including China, Columbia, Finland, France, Italy, Portugal and the United States. The competition was launched two years ago by the UN Educational, Scientific and Cultural Organization (UNESCO), with support from the UN Department of Public Information’s Remember Slavery Programme, and Member States from the Caribbean Community (CARICOM) and the African Union. Jamaica serves as Chairman of the Permanent Memorial Committee. 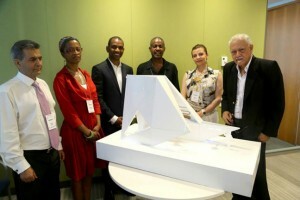 A special Unveiling Ceremony was held at United Nations Headquarters in New York on September 23, 2013 to recognize the competition’s finalists and officially announce Leon’s winning design. Notable presenters and guests included: Secretary-General Ban Ki-moon; Under-Secretary-General for Communications and Public Information, Peter Launsky-Tieffenthal; Mr. John W. Ashe, President of the 68th session of the General Assembly; Portia Simpson Miller, Prime Minister of Jamaica; Arnold Nicholson, Minister of Foreign Affairs of Jamaica; Pierre Richard Casimir, Minister of Foreign Affairs and Religion of Haiti; UNESCO Director-General Irina Bokova; and Mr. Courtenay Rattray, Chair, Permanent Memorial Committee. The memorial’s exterior form is constructed in a fashion to reflect the image of a vessel or ship in acknowledgement of the millions of African people transported on slave ships to different parts of the world during the “Middle Passage.” Images of maps depicting the “Triangular Slave Trade” influenced the use of the triangle as a primary element in designing the memorial’s shape. The memorial is conceptually also organized in three parts and visitors are meant to pass through The Ark of Return to intimately experience three primary elements on the interior space. Native New Yorker Rodney Leon, the founder and principal of Manhattan-based Rodney Leon Architects PLLC, has an architectural background as a designer on a diversity of projects including memorials, housing, churches and cultural institutions in the U.S. and abroad. Leon received his Bachelor of Architecture degree from Pratt Institute School of Architecture and his Masters of Architecture from Yale University. As a graduate student, he served as a teaching assistant for the eminent African art historian professor Robert Farris Thompson and after graduation spent time living and working in the Ivory Coast, West Africa. Among Leon’s various honors and accolades, in 2005 he was awarded the prestigious commission for design and construction of the African Burial Ground Memorial in New York City, which is the only National Monument in the United States dedicated to the contributions of people of African descent. As a first generation Haitian-American, Leon is also an active supporter of philanthropic causes benefiting Haiti. He is a founding Board Director of The Haitian Roundtable and serves as a lecturer, media expert and presenter on the subject of Haiti’s reconstruction since the January 2010 earthquake. WASHINGTON, Sept. 10, 2013 /PRNewswire/ – Global cocoa sustainability experts and practitioners will gather in Santo Domingo, Dominican Republic, on October 15 – 16 for the World Cocoa Foundation (WCF) 24th Partnership Meeting & Cocoa Sustainability Trade Fair. More than 300 guests representing the chocolate and cocoa industry, governments, NGOs, academia, and research institutes from Latin America, the Caribbean, North America, Africa, Asia and Europe will use the occasion to learn about the latest developments in efforts to ensure greater sustainability in the sector. To register, view the agenda, or learn more about the Partnership Meeting, visit: worldcocoafoundation.org/wcf-partnership-meeting. Participate in the meeting remotely by following #WCFPM on Twitter. WCF is an international membership foundation of more than 100 companies that promotes a sustainable cocoa economy by providing cocoa farmers with the tools they need to grow more and better cocoa, market it successfully, and make greater profits. For more information, visit www.worldcocoa.org. CaribPR Wire, ROSEAU, DOMINICA, (September 9, 2013) Brother International, the office equipment manufacturer world renowned for quality, reliability and value, introduces a new series of monochrome laser printers and all-in-one machines designed specifically for emerging markets around the globe including the Latin American region. The new series was developed for consumers, entrepreneurs and small business owners who desire more professional looking documents but until now thought the cost was prohibitive. The new series enhances the Brother offering in the region by adding a line of entry-level laser printers to its already extensive line-up of printers, all-in-ones, scanners and P-touch label makers. The new series was designed in Japan specifically to enable entrepreneurs and small businesses owners to have a feature-rich machine at an affordable price. In addition, the compact stylish design can fit in any home or small office where space is at a premium. The new series consist of a single function printer (HL-1112), a three-in-one (DCP-1512) and four-in-one (MFC-1810) to meet any document output need. They offer fast print speeds of up to 21 ppm as well as a high quality output of up to 2400 x 600dpi. In addition, the machines use economical replacement toners and feature a Toner Save Mode to help save money throughout ownership. Brother International also provides a one-year limited warranty on all machines as well as free phone support for the life of the product. In addition to the features available on all of the printers, the DCP-1512 and the MFC-1810 also provide fast, stand-alone copying (no computer required), a high resolution glass flatbed scanner, and a 150 sheet capacity paper tray that holds up to legal size paper. The MFC-1810 four-in-one, featuring fax capability, has a 10-page capacity auto document feeder for easy copying, scanning and faxing. Brother International Corporation is one of the premier providers of products for the home, home office and office. The company currently markets many industrial products, home appliances and business products manufactured by its parent company, Brother Industries, Ltd. of Nagoya, Japan. These products include an award-winning line of Multi-Function Center® machines and printers. Brother also provides a line of facsimile machines and is the leader in electronic labeling, with its full line of P-touch® Electronic Labeling Systems. For more information you can visit the website at www.latinamerica.brother.com. 2 PPM speed is based in printing in FAST mode and excludes time to complete first page and will vary depending on a variety of factors. CaribPR Wire, MIAMI, Fla. – August 28, 2013: An aggressive form of skin cancer silenced the living voice of Bob Marley, the legendary reggae star, who died more than three decades ago in Miami. Marley’s musical legacy endures with sad notes about skin cancer, the most common form of cancer in the U.S., according to the U.S. Environmental Protection Agency. Every year more than 3.5 million cases of skin cancer are diagnosed, the EPA reports. No one is immune. Asians, non-white Latinos, and people of African or mixed descent can develop melanoma and other forms of skin cancer—and are doing so at increasing rates, according to national statistics. Due to the myth of melanoma immunity—outdated beliefs held by some patients and even doctors—people of color may not be diagnosed with skin cancer until it’s almost too late, when the disease is more dangerous and difficult to treat. Delays in treatment can be fatal. Dorsey Goosby, M.D., a Board-certified pediatrician and chief medical officer at Homestead Hospital suggests that everyone, no matter what their skin color is, use broad spectrum sunscreens with sun protection factor (SPF) of 30 or higher and follow other sun-safety guidelines..
Baptist Health South Florida is the largest faith-based, not-for-profit healthcare organization in the region. It includes Baptist Hospital, Baptist Children’s Hospital, Baptist Cardiac & Vascular Institute, South Miami Hospital, Homestead Hospital, Doctors Hospital, West Kendall Baptist Hospital, Mariners Hospital and Baptist Outpatient Services. Baptist Health Foundation, the organization’s fundraising arm, supports services at all hospitals and facilities affiliated with Baptist Health. Baptist Health International is one of the largest hospital-based International programs in the United States. Thousands of people travel to Miami each year from around the world to receive care from our respected physicians at the Baptist Health South Florida facilities. Baptist Health International is dedicated to providing comprehensive, high-quality services for international physicians and their patients, including hospital admissions, outpatient testing and physician consult, as well as concierge services. ITASCA, Ill., Aug. 13, 2013 /PRNewswire-USNewswire/ – The National Safety Council, a global leader in driver safety training for almost 50 years, has launched the NSC Defensive Driving Course – Left Side of the Road for the Caribbean nations. This course is designed specifically for motorists who drive in countries with road systems that pass oncoming traffic on the left side. To learn more about the DDC-LSR program, or how to become a certified training center in your area, please visit nsc.org/lsr.